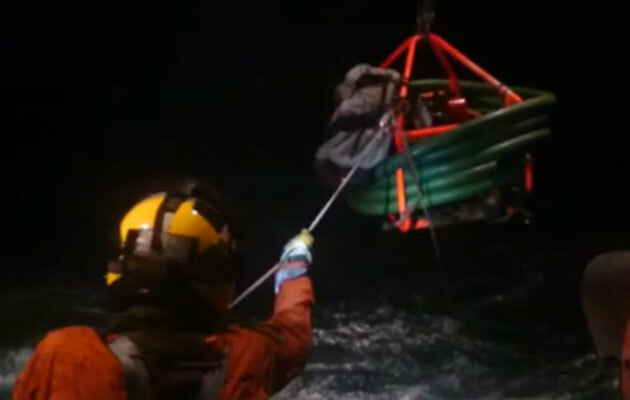 A sinking yacht and its crew were involved in a dramatic rescue on Friday after the vessel sprung a leak off the coast of Northumberland. Fancy Free and her two crew noticed they were taking on water at around 11pm and contacted the coastguard requesting immediate assistance. The situation was made worse by rough conditions as the crew battled against strong winds and heavy swells. An RNLI lifeboat was sent to the scene three miles south east of Coquet Island and arrived shortly after 11pm. Once there, volunteer crews boarded the sinking yacht before transferring a salvage pump onto the vessel. A second pump was brought to the scene soon after following a request to RAF Boulmer. Rescue crews worked tirelessly to save Fancy Free and after more than an hour, enough water had been pumped off to attach a line and recover the vessel. Due to a low tide, the recovery of the yacht was delayed, with RNLI crews towing the yacht back to the safety of Amble harbour for repairs at around 3.30am. Coxswain David Bell: “A long and difficult night for the volunteer crew, but the outcome was worth it.